Our comic today is Hägar the Horrible. It was published on July 11, 2015. This happens when you wear shoes. So I guess shoes can have a use, after all. This comic is from August 8, 1973, right when many businesses started putting up “No Shirt, No Shoes, No Service” signs in reaction to hippies. The comic is “Archie”, written by Bob Montana. The character here is Jughead. What’s odd here is that the restaurant doesn’t seem to mind that Jughead is shirtless, just shoeless. And we see the kind of improvisation that barefooters sometimes have to resort to. Today’s comic is from Bizarro, written by Don Piraro. These comics pretty much always live up to their name. This comic is quite recent, appearing on July 8. This is of course entirely unrealistic. 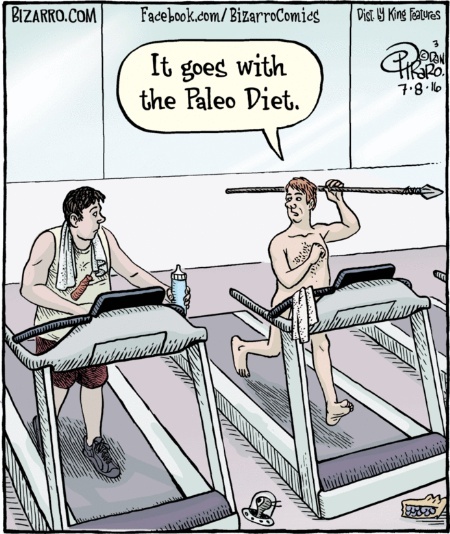 Gyms are notorious for not allowing barefooters to use the treadmill barefoot. Today’s comic comes from the June 29, 1951 edition of “All in a Lifetime”. Of course the joke is about messing up a new rug, but notice there is not a whole lot of concern that the boy had hurt his foot. Back then, this was just one of those things that happened, like a skinned knee, and wasn’t worth worrying about. And these days, with us being more environmentally conscious and with a lot less litter, there are a lot fewer old tin cans lying about. Does Running Barefoot Improve Your Working Memory? There have been quite a few articles out about a new study that claims that running barefoot, as opposed to running shod, improves your memory. I thought I’d take a look at the study to see what it really said, and just what it means to improve your working memory. Barefooters probably won’t like what I have to say. I did my first Saturday Comic back on July 6, 2013, and have managed to show one every weekend since then. Not only that, I’ve never repeated a comic. Who knew there were so many barefoot-relevant comics out there? I even have a few more packed away, so I’ll be able to keep doing this for a little while longer, at least. For today’s comic I’m going to show one that I have shown before, but that was before I started doing the Saturday Comic. That means it hasn’t been here for at least three years and might be new to a lot of you. 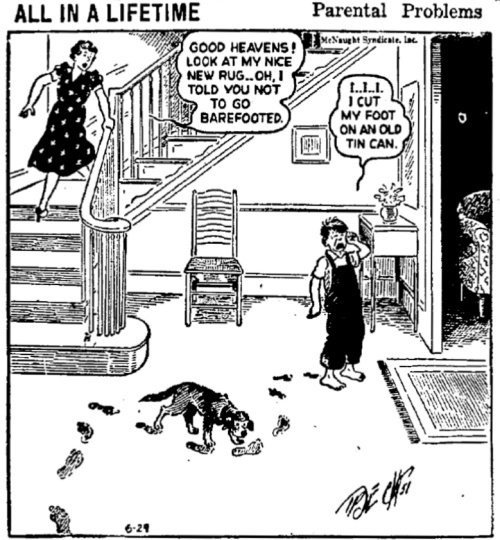 Regardless, I think it is my favorite barefoot comic. It’s from the strip Arlo & Janis by Jimmy Johnson. The main characters are named after Arlo Guthrie and Janis Joplin, so there has always been a bit of a hippie vibe to it. I did modify the comic just a bit, but I think it sums up beautifully some of the challenges of being a barefooter.